AKARI means "light" in Japanese. The Japanese infrared satellite AKARI was launched in February 2006 to illuminate the dark sky and create a new sky map in the infrared. In the course of AKARI's 18-month cryogenic mission phase, the 68.5 cm cooled space telescope completed an all-sky survey at six infrared wavelengths and executed several thousand deep pointed observations. The first international symposium highlighting AKARI's discoveries, "AKARI, A Light to Illuminate the Misty Universe," was held to discuss early results of AKARI observations. The symposium was attended by about 150 participants from more than 10 countries, and included 31 invited talks, 25 contributed talks, and 56 poster papers. The topics of the symposium covered a wide range of subjects including solar system objects, star-formation, stars, interstellar medium, galaxies, and cosmology. 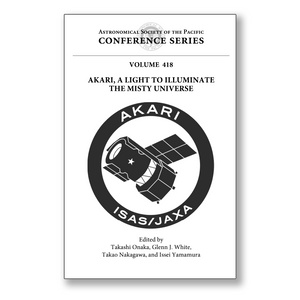 The symposium provided a good opportunity for expanding AKARI observations into new lines of research, and the symposium proceedings will enhance the value of AKARI observations for the wider astronomy community, particularly as AKARI collects near-infrared observations during its continuing warm mission.